Top bicycle tours in Europe are ready for cycling! bicycle tours, as well as bike tours in countries whose cyclotourism boom is just coming. or mountain ranges to be crossed during the tour, with long, steep climbs. The route is suitable for well-trained recreational cyclists or accomplished sports enthusiasts, who will enjoy the very difficulty of the terrain. Easy - bike tour follows a course of a river, usually downstream; the terrain profile is almost level, the route can be easily traveled by beginner bikers. Why are bike tours in Europe a good choice? 1. Europe is rich in history, yet it offers modern facilities and sophisticated services. be easily covered by bicycle. quaint little cafes, and much more. with a dense network of well-surfaced backroads, creates ideal conditions for biking. 5. 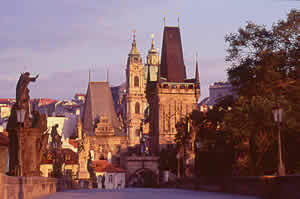 Moreover, visitors to Central Europe benefit from an excellent price/value ratio. All our bicycle tours follow mostly a solid surface (tarmac), and are well suited for hybrid bikes, many of them also for road bikes. At some tours there are a few short sections with fine gravel or compacted dirt surface, where we either provide modified road bike itineraries (Greenways) or encourage you to ride a hybrid (e.g. Amber Trail or Danube Trail II). In Central Europe there is a dense network of backroads ideal for cycling. Their surface is of good quality and there is little traffic. All our routes follow the 2nd or 3rd class roads or dedicated bike paths (mainly in Austria and Germany). Should you cross a busy road, the route instructions will always warn you in advance. The average daily riding distance at our tours is about 50 km / 32 miles. The road bikes tours daily average is about 80 km / 50 miles. Our desire is to offer a balanced, but not a boring tour, so some riding days might be quite short with ample time to relax and do sightseeing, other a bit longer to enjoy the ride itself.